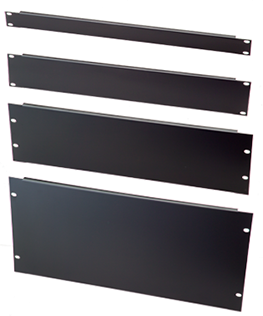 Top panel brush strip plates are used for convenient cable entry through the top of the rack. Allows cables to pass, but blocks air and contaminants. Easy to install to top panel (roof). High grade cold rolled steel, thickness 1.2 mm. Tough scratch resistant powder coat finish. any top panels, or in the 800 wide side channel covers. Metal plate available without fans. High grade cold rolled steel 0.9 mm thickness. A frequently over looked component in air flow management, blank or filler panels allow you to close up unused U space. This forces incoming cool air to pass through active components with pull fans already installed in your cabinet. It also blocks the hot air from the rear side to mix up the cool air at the front side. Simplified design to enable quick and easy installation or removal. Gasket in place seals panel against 19" vertical rail, preventing unwanted air leakage. Low profile front surface that does not interfere with vertical airflow. Available in 1U to 5U. High grade cold rolled steel 1.2 mm thickness. Base filler panel kits helps to prevent air leakage, dust and vermin intrusion. Powder coat finish preceded by 5 stage iron phosphate pre treatment.